And many more pre-installed, with more in its package repositories. Fatdog is versatile: Use is at a Live CD (or Live USB), or install it. Installation requires *no* re-partitioning. Fatdog can store its settings in your existing partition: FAT, Ext2/3/4, NTFS partitions are supported, as well as CIFS shares and LVM and mdadm partitions; on your harddisk, USB flash drive, or DVD+RW. PXE-booting Fatdog is easy - only two files are required. In either case, the resulting CD/DVD or USB flash drive will boot on standard systems, UEFI systems, and systems with Secure Boot enabled (Windows 8 and 10). A big thank you goes to University of North Carolina at Chapel Hill for www.ibiblio.org and for hosting Fatdog64! Click here for info on the latest release. Click here to download the ISO file and burn your own CD (or here for latest pre-releases). 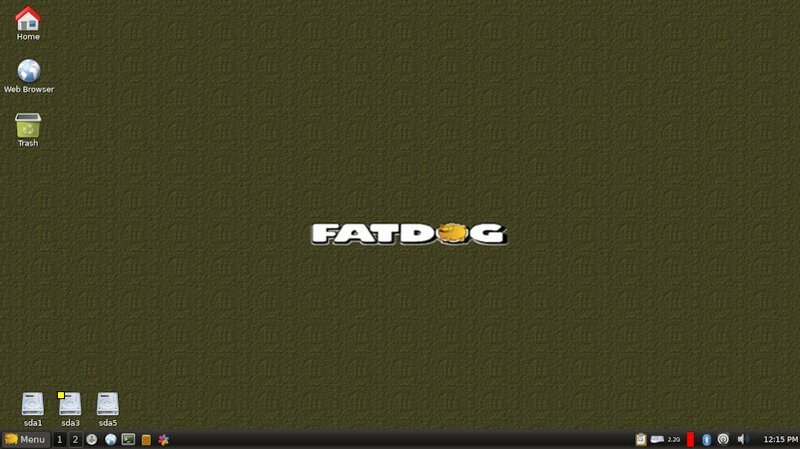 Also check out FatdogArm, a port of Fatdog64 to the ARM platform. A txz package is a compressed archive that contains a (usually) single application package. Upon installation the contents will be de-compressed and copied to the Fatdog installation for use. You can install a txz package by downloading it (from here) and then right-clicking on it; or you can use the Package Manager (gslapt). Note: Fatdog uses the same packaging as Slackware (in fact Fatdog adopts Slackware package management tools) but is not based on Slackware so while you can install Slackware packages, they may or may not work. TXZ packages are used starting with Fatdog 700. Earlier Fatdogs use PET packages which are in the same format as Puppy Linux packages. Note: Do not attempt to install packages directly from the web browser - the web browser does not have sufficient rights to install packages. An SFS package is a file that contains a compressed filesystem (squashfs). Upon "installation" the contents of this filesystem will be merged with the rest of your filesystem but it is never copied or expanded; the content will be de-compressed on-demand when you use the applications contained in the package. To use it, download the package from here and move it to the same location as your save file, then go to the System tab in the Control Panel and click on System SFS Loader. Then choose which SFS file to load. You can also use SFS Manager (also in the Control Panel). An SFS package usually contains a large application (e.g. libreoffice) or contains multiple applications or libraries, e.g. the fd64-devx_xxx.sfs file, which contains the GCC compiler, python, headers, etc. ; everything you need to compile stuff. You can also get all the source packages used to build Fatdog. Ibiblio has mirrors around the world. Click here to find a mirror near you. Most of Fatdog64's documentation is found here, applicable to the latest version of Fatdog. The same information is also included in your copy of Fatdog, located in file:///usr/share/doc/faqs/faq.html, or by clicking the "Help" icon on the desktop. You can also get the Beginner's Guide, courtesy of smokey01. Fatdog64 doesn't have its own forum, instead it piggybacks on Puppy Linux Discussion Forum. Fatdog64 posts are usually found in the Puppy Projects subforum. The support thread for the currently released Fatdog version is here. Fatdog has a long history. Click here to to view how Fatdog was started and how it grew as the years passed by. Fatdog was created by kirk; and is currently maintained by kirk, james, SFR and step. Fatdog Linux and Fatdog64 Linux is copyright (C) Kirk and James 2008 - 2019, based on derived works from Puppy Linux, copyright (C) Barry Kauler 2003 - 2014 and many other contributors. Fatdog64 is distributed under GNU General Public License (GPL) Version 2 or later. Note that individual programs and scripts contained in Fatdog may be licensed differently, so please see their descriptions for details. The original Fatdog64 logo is designed by AFG Sinaulan (forum member "afgs") and is licensed under Creative Commons Attribution Sharealike (CC-BY-SA).